Resource Guide for Expecting, New and Experienced Parents of Twins, Triplets, and Higher Multiples. One of the first things we discovered as expecting parents of twins – and in our lives with twins – is twin families can use all the help, support and resources they can get! Below are links that we believe you will find useful. This resource guide is a service to our visitors. Please contact us to add your club, organization, support group, or class to the list! It’s confirmed – you’re expecting multiples! NOW what do you do? We recommend that you find an expecting multiples class near you and take it around weeks 16 – 20 of your pregnancy! Marvelous Multiples ® is a great website for information about multiple pregnancies, finding a care provider, finding an ‘expecting multiples’ prenatal class near you, and links to other resources on the web. There is nothing like the camaraderie amongst the parents of multiples. We seem to be magically ‘drawn’ towards each other – in restaurants, in stores, at concerts and other events. Multiples Clubs are a great way to meet friends for yourself and the rest of your family, find mentors who have made it through whichever stage you and your twins are entering, and there’s always someone with advice on how to handle everything from feeding two babies at once to finding a pediatrician to finding a babysitter for two. Whether you are new to town or new to the world of multiples, a Multiples Group is a great way to make friends for every one in your family. The National Organization of Mothers of Twins Club is not just a Moms Club, and not just a Twins Club. 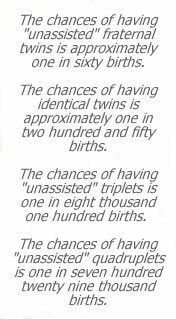 NOMOTC offers support for parents of twins and all higher multiples. Their website allows you to search for a club near you using a zip code search, or by browsing their state-by-state club listings. Unfortunately, sometimes families face circumstances or challenges beyond the normal challenges a family of multiples face. Support groups play an integral part in helping fact these challenges.